An onslaught of digital trickery steals the show in a new Broadway musical about the Romanov princess. 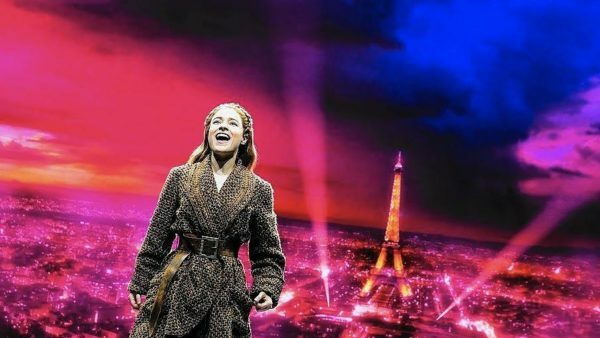 The animated film Anastasia makes perfect sense for a stage adaptation, with its sweet romance, catchy Ahrens and Flaherty songs, and a sweeping setting of revolutionary Russia to the Paris of the ’20s. But the likable Broadway cast and well-crafted new tunes created for the stage musical (music by Stephen Flaherty, lyrics by Lynn Ahrens) cannot cure this projection-heavy production of its unimaginative staging and digitally dependent look. Anastasia remains a family-friendly endeavor and fans of the film may be happy enough just to hear their favorite songs from the movie sung by the able cast but I think these fans (myself included among them) deserve a better rendering of the story and music we so love. What appealed from the film was a strong leading female character and her journey of trying to find somewhere to belong. Much of the cinematic narrative remains as we follow the Grand Duchess Anastasia Nikolaevna of Russia who was the youngest daughter of Czar Nicholas II’s children. After the royal family are executed by the Bolsheviks, rumors begin to surface that perhaps Anastasia survived. On the streets of St. Petersburg, amidst the poverty and paranoia driven by the increasingly autocratic control of the Red Army, Dmitri (Derek Klena) and Vlad (John Bolton) think that finding someone to pose as Anastasia will be their ticket out of Russia. They audition women to participate in their con. Anya (Christy Altomare), suffering from amnesia, stumbles her way into their scheme. They try to convince her she could be the lost Romanov and Pygmalion-esque lessons abound. All three head to Paris to reunite her with her grandmother, the Dowager Empress (Mary Beth Peil), who has offered a reward for Anastasia’s safe return. The musical abandons the supernatural elements of Rasputin from the film (and the comic relief from his bat pal, Bartok) and instead creates a new villain who’s more rooted in political history, Gleb (Ramin Karimloo). Gleb is a party apparatchik who proudly boasts that his father pulled the trigger on the Czar and the Romanov family. The book of the musical by Terrence McNally lightly dusts the “politics” of Russia and its Soviet past into the happenings but it’s an awkward fit into what is essentially a story set around the burgeoning romance between Dmitri and Anya and Anya’s search for her identity. In a world of Red and White, Gleb’s motivations are opaque and colorless. Is he kind of into Anya? Is he a creep or a charmer? Is he a true believer in the acts of political repression he’s participating in? He’s no single-minded Javert but the complexities of the politics of the times don’t get a crisp airing here either. He’s frustratingly enigmatic or worse, wishy-washy. In addition, the digital projections of digital shadow soldiers standing beside digital flags representing digital violence does not generate the ominous threat perhaps the creators intended. Empty images at empty tables, team. It’s the critical failing of the musical. Director Darko Tresnjak does not find the appropriate visual language for the tale. Nearly the entire show is brightly illustrated with photo-realistic style projections, some of which include moving sequences (imagine passing scenery as the characters are sitting on a “stationary” train). Sometimes these projections leap from the stage to the audience—so that dancing “ghosts” (or blurry white blobs) surround us. But the design schema is more cheesy amusement park ride rather than a way to magically transport us to another world. Except in select moments, the images are illustrative instead of emotive. There’s a boring literalism to it—it’s clear exactly where we are but each flat space (even if rendered with faux depth) is entirely devoid of meaning or presence. The cast has got charm to spare but it’s hard to compete with the endless screens trying out shine them. Klena and Altomare have decent chemistry and the romantic moments meant to rattle them about their feelings for each other work. The new song, “In a Crowd of Thousands,” handily presents their current predicament—commoner and royalty—as well as how they are inextricably linked to one another. Otherwise, Klena can be a bit wooden. He needs the right director to pull a multi-faceted performance out of him (paging Joe Mantello). Altomare is darling but she’s given little to work with. One of the qualities so apparent in the film is the independent, vivacious quality of the character of Anya. Though the musical still gives her this streak of independence and a healthy dollop of self-reliance (she manages to fend off a phalanx of attackers nearly single-handedly to the roar of the audience’s delight), the sassy voice from the film is not as apparent in McNally’s book. We see brief flickers of her strong personality but I longed for more. In contrast, the Dowager Empress’s lady-in-waiting Countess Lily (Caroline O’Connor) gets to be bright, bold, and teaming with pizzazz. Mary Beth Peil is pitch perfect as the regal Dowager Empress with a broken heart. I wish the creative team had had more faith in their spunky human heroine and not fallen prey to an unfortunate screen addiction.